Definition: Pricing is the method of determining the value a producer will get in the exchange of goods and services. Simply, pricing method is used to set the price of producer’s offerings relevant to both the producer and the customer. Every business operates with the primary objective of earning profits, and the same can be realized through the Pricing methods adopted by the firms. The price of similar product/service in the market. The cost of production viz. Labor cost, raw material cost, machinery cost, inventory cost, transit cost, etc. External factors such as Economy, Government policies, Legal issues, etc. 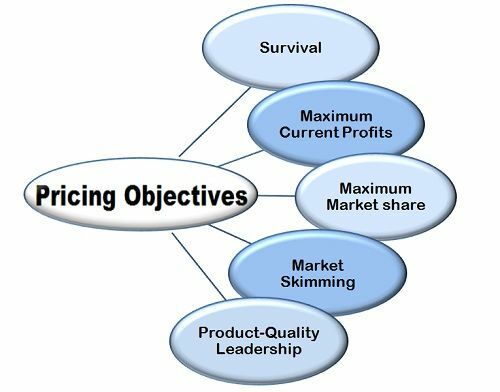 Survival: The foremost Pricing Objective of any firm is to set the price that is optimum and help the product or service to survive in the market. Each firm faces the danger of getting ruled out from the market because of the intense competition, a mature market or change in customer’s tastes and preferences, etc.Thus, a firm must set the price covering the fixed and variable cost incurred without adding any profit margin to it. The survival should be the short term objective once the firm gets a hold in the market it must strive for the additional profits.The New Firms entering into the market adopts this type of pricing objective. Maximizing the current profits: Many firms try to maximize their current profits by estimating the Demand and Supply of goods and services in the market. Pricing is done in line with the product’s demand in the customers and the substitutes available to fulfill that demand. Higher the demand higher will be the price charged. Seasonal supply and demand of goods and services are the best examples that can be quoted here. Capturing huge market share: Many firms charge low prices for their offerings to capture greater market share. The reason for keeping the price low is to have an increased sales resulting from the Economies of Scale. Higher sales volume lead to lower production cost and increased profits in the long run.This strategy of keeping the price low is also known as Market Penetration Pricing. This pricing method is generally used when competition is intense and customers are price sensitive. FMCG industry is the best example to supplement this. Market Skimming: Market skimming means charging a high price for the product and services offered by the firms which are innovative, and uses modern technology. The prices are comparatively kept high due to the high cost of production incurred because of modern technology. Mobile phones, Electronic Gadgets are the best examples of skimming pricing that are launched at a very high cost and gets cheaper with the span of time. Product –Quality Leadership: Many firms keep the price of their goods and services in accordance with the Quality Perceived by the customers. Generally, the luxury goods create their high quality, taste, and status image in the minds of customers for which they are willing to pay high prices. Luxury cars such as BMW, Mercedes, Jaguar, etc. create the high quality with high-status image among the customers. Thus, every firm operates with the ultimate objective of earning profits and, therefore, the price of a product must be set keeping in mind the cost incurred in its production along with the benefits it offers for which people are ready to pay extra.